Pueraria mirifica, also known as Kwao Krua, is a root found in northern and north eastern Thailand and Myanmar. In Thailand, the plant “Kwao Krua” is considered to be a rejuvenating adaptogenic herb and has a history of use in folk medicine. Although the name “Kwao Krua” had been applied to several species of plants having tuberous roots, it was definitively identified as Pueraria mirifica in 1952 from which an unusual estrogenic phenol miroestrol was isolated. There are two kinds of Kwao Krua roots, namely white and red. The White Kwao Krua is the herb used by females and the Red Kwao Krua is the herb used by males. White Kwao Krua has a high concentration of phytoestrogens, while Red Kwao Krua is used by males and has aldosterone, which is a natural hormone. What does Pueraria Mirifica do? Pueraria Mirifica not only improves the nutritional support the woman's body but speeds up the process of enhancing the breasts and has the ability to maintain the increasing breast size permanently. A perfect choice for menopausal issues. It also improves nutritional support for breast care and the firmness of the breast and cleavage. Pueraria Mirifica is a real "multifunctional" plant which works perfectly when taken correctly. Your body will feel younger, energic and looks healthier. Your skin will be beautiful, in top condition, full of nutrients and feel smooth and elastic. Pueraria Mirifica is not just for breast enlargement & firming. It also helps to promote healthier skin. It’s good for women who suffer all kinds of skin problems. Hair growth is better and stronger after 3-8 weeks of daily usage, your scalp feels like it has been "reborn". First signs of effects are usually skin related. Facial skin feel less oily and more elastic, this usually happens between 10 and 30 days. At this point breasts will start to get firmer while Pueraria Mirifica does its miracle work. Not only does it improve the nutritional support for the female body, but speeds up the process of enhancing the breasts. 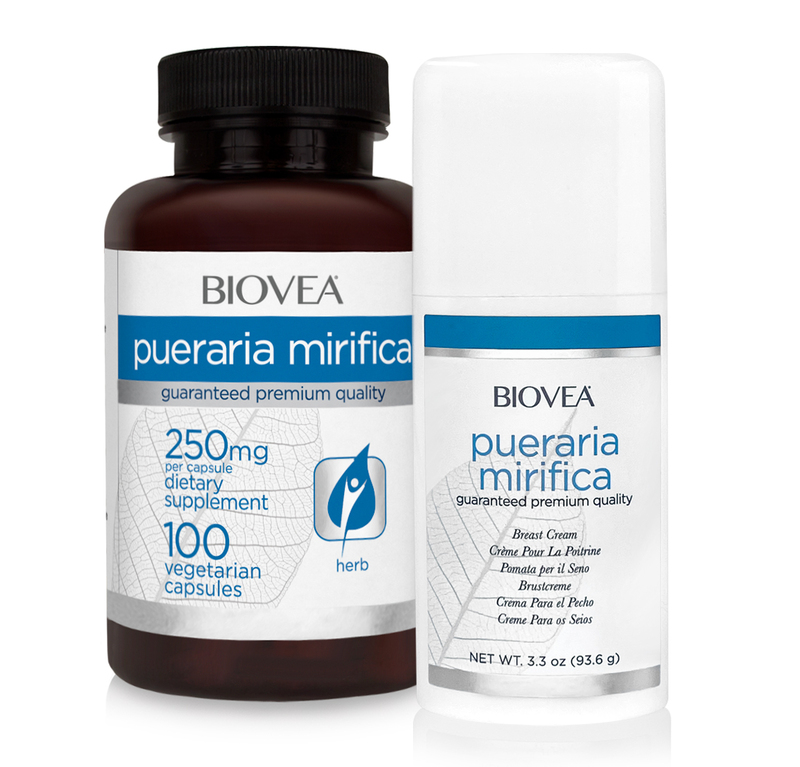 Pueraria Mirifica has the ability to maintain the increasing breast size permanently. Phytoestrogens promote breast tissue development and stimulate the development of mammary tissues. • Evening Primrose Oil: May be more familiar as a gamma linoleic acid oral supplement. However, it is also a useful oil in creams with its excellent moisturising qualities. It is best used for dry, ageing skin. • Jojoba Oil: It is light-textured and deeply penetrating, making it a valuable oil for all skin types. The chemical composition of jojoba closely resembles sebum, the skin's natural lubricant. This gives jojoba oil exceptional moisturising and emollient properties. • Avocado Oil: Is a deep penetrating oil and has a slightly nutty aroma. Avocado oil is very rich and nutritious and is suited to undernourished, dry, dehydrated and mature skin. It is high in monounsaturated fats and Vitamin E. Avocado oil is regenerative and it has excellent moisturising qualities. • Shea Butter: Protects and regenerates the skin. High in Vitamin A, E and F. It provides skin with all the essential elements it needs for good balance, elasticity and tone and can be used on all skin types. The chemical composition of shea butter is close to vernix, the substance found on newborns at birth. Its excellent for the prevention and treatment of stretch marks and other kinds of scar tissue. Shea Butter has a high concentration of nonsaponifiable fatty acids, which promote cellular growth, helping to restore damaged skin. Other Ingredients: HPMC vegetable capsule, rice flour, vegetable magnesium stearate. Aqua (water), Simmondsia chinensis (Jojoba) Oil, Isopropyl Myristate, Evening Primrose Oil, Stearic Acid, Beeswax, Persea gratissima (Avocado) Oil, Cetyl Alcohol, Butyrospermum parkii (Shea Butter), Polyacrylamide (and) C13-14 Isoparaffin (and) Laureth-7, Phenoxyethanol, Pueraria Mirifica (Kwao Krua) Extract, Tocopheryl Acetate (Vitamin E), Allantoin. Take 2 capsules daily. 1 in the morning and 1 at night with a warm cup of milk to help absorption. Warning: If you are pregnant, nursing, have any health condition or taking any medications, consult a healthcare professional before using this product. KEEP OUT OF REACH OF CHILDREN. Store in a cool, dry place. Do not use this product if safety on the bottle is broken. Gently massage onto the skin of your breast. For best results use at least twice a day. Warning: Do not use if you are pregnant, lactating or intend to become pregnant. For external use only. Avoid contact with eyes, if contact occurs flush thoroughly for several minutes & contact a healthcare professional if irritation persists. Use intended for adults 18 years of age and older. Keep out of the reach of children. Do not exceed 2oz. of this product topically per month. Consult with your physician before using this product. Store in a cool, dry place. Discontinue use if rash or irritation occurs. My first time to use this Pueraria Mirifica Breast care and I am amazed by the result. I am now 1 month using it and I can see the result and it is really working. Best and less for a very promising result! I am very happy to find this product! Has been a month since I began taking the tablets My hot flushes have decreased to minimum I have a good feeling how the cream is working The skin feels smoother and younger . It is still early days as I have not been using it for long but so far so good, can't see any difference but live in hope. It works but don't expect overnight miracles. A great quality product that truly works. With PM, don't expect overnight miracles, it does take a minimum of 3 months to start seeing changes but around 6 months to get a noticeable gain, and longer for continued gain. Have been using a couple weeks now and already notice the difference...definitely ordering more! I am onto my fourth bottle of capsules and 3rd cream pack and I have noticed a big difference! Although I don't use the products everyday religiously (maybe 3/4 times a week) my breasts are definitely a lot fuller (from a small B to a full B). When taking the tablets I usually take 2 in a day (in one go) followed by a cup of hot milk. Will try to start using these daily for more results.